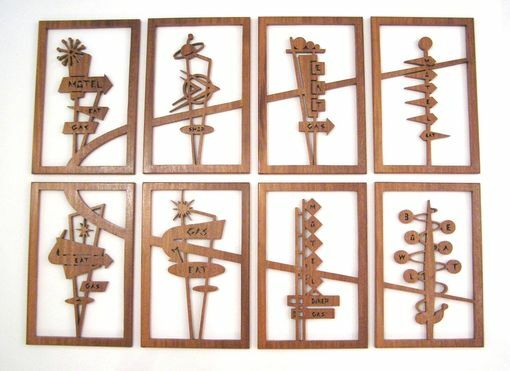 Mahogany 8-Panel Mid-Century Modern Fretwork Collage "Googie Signs 2"
This fretwork collage is made of mahogany and consists of 8 panels. Each panel measures 9 1/2''x14 1/2''. Designs on the fretwork are inspired by googie road signs that were popular back in the 1950s. The fretworks have brackets attached on the back for easy hanging. Clear coating was applied on the wood panels for lasting protection from elements. This fretwork collage looks great in modern-themed homes and offices. The grain and wood color varies from panel to panel.